I’m absolutely delighted to have snapped some lovely photos of this teeny-weeny beauty basking in the sun at our flower bed a few months ago! So tiny yet attractively colourful, capturing my attention as it flew swiftly and darted restlessly from flower to flower seeking nectar. Or was it trying to quench its thirst on the large droplets of water that settled on the leaves and flowers during the heavy shower earlier on? 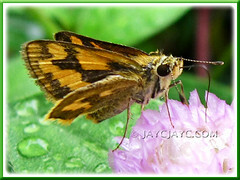 Potanthus confucius is a very small skipper butterfly with a wingspan of 18-22 mm, belonging to the family Hesperiidae. 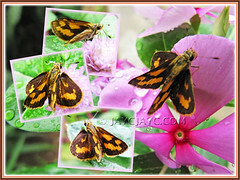 As characteristic of most Skippers, it has a wide head, hooked antennae, large eyes and a thick and hairy moth-like body. Also, it has a rapid, jerky and skipping flight and loves to bask in the sun in the typical Hesperiine posture, with the forewings held at 45° angle or almost upright while the hindwings held flat-open horizontally. 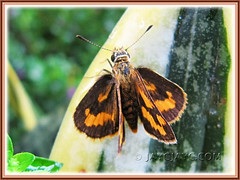 The upperside of both set of wings has a pattern of yellowish-orange markings on a dark brown ground colour in wonderful contrast, while the undersides are a shade lighter. The yellowish-orange markings on the male are more pronounced while those of the female less distinct. 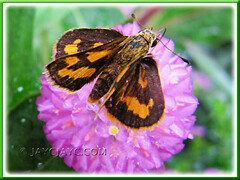 More descriptive details of Potanthus confucius can be read at Butterflies and Dragonflies of Sri Lanka. Distribution range: A very common butterfly that is widely distributed, extending from Southeast India, Myanmar to China and Thailand, Malaysia, Singapore, Sumatra, Borneo, Sulawesi, Java and the Philippines. Habitat: Disturbed grassland, region with low-growing vegetation, gardens and parks, especially where Bamboos are available for breeding. Hostplant(s): The larvae feed on grasses and leaves of Bambusa (bamboo) of the family Poaceae. Potanthus canfucius looks different then mine,i just took phot very recent from low altitute.